â€œI’ve never, in any series of the Apprentice seen anyone fail so completely and utterly as Simon did tonight, and not get fired.â€? The basic task was simple. Sir Alan had lined up an hour in prime time for each team with shopping channel Ideal World. Each team split into a single and a pair and selected two products for the other part of the team to sell live on air whilst the others were in the gallery producing, and the winner was the team that produced the most cash. As always they had a wide variety of products to choose from ranging from low value high volume to high value low volume items, although Sir Alan explicitly advised against gambling on a high value item to get through the task. He also mixed up the teams again, swapping Lohit and Naomi. The project managers for the task were the only two candidates to have been on the same team all the way through, Kristina for Stealth and Simon for Eclipse. Neither team can really walk away from the task feeling proud – Ideal World quite literally lost thousands of pounds over the two hours, with both teams bringing in barely a tenth of the sales that the channel would usually expect. More than that their appearance actually produced complaints from the viewers of the channel! If anything it proved that selling on TV is a lot more difficult than one might expect. Both teams had an eclectic mix of products, and exhibited various levels of ineffectiveness over the selling ranging from just appearing generally uncomfortable, through unintentional comedy in product demonstrations through to Kristina who in the process of struggling with demonstrating a mop actually swore live on air. Ultimately though it was Simon and Eclipse who sold least, and it was Simon, Tre and Naomi who ended up in the boardroom facing Sir Alan. It is worth going over quite what a mess of the task Simon actually made. Like Kristina he decided to select himself as the single, and pair up the other two team members. Whilst that put Naomi who was by far the strongest presenter of the three with Tre who for once admitted that he wasn’t good at something, it was a significant mistake when it came to guiding his team members from the gallery as they tried to sell the items he had selected, as he dried totally. Indeed on the live show the professional producer from Ideal World was looking significantly concerned at his lack of interaction. However his lack of interaction paled into insignificance against the product choices. Naomi and Tre selected some pads to allow craft fans to easily produce decoupage, and an exercise trampoline, whilst Simon ignored the advice of Sir Alan and picked a hair-removal kit, and a luxury folding wheelchair. When the time came around to present the items, Naomi and Tre seemed to have tried to make the best of the choices they had been given and understand their products. Simon however seemed to be trying to wing it. A staff member at the channel expressed concern that Simon had made no effort to understand what decoupage actually was, and had done about the same amount of work to understand the trampoline – and it showed. Simon failed to sell any trampolines at all, and the decoupage pads didn’t do much better. Naomi and Tre did slightly better, even managing to sell two of the wheelchairs, netting more than half of their final total. On that basis, it seemed pretty clear who was going to go. On the other hand Naomi and Tre had, despite the products Simon had landed them with managed to sell two expensive wheelchairs, and brought in the bulk of the money on the task. Also against Simon was the fact that throughout all the previous weeks he had never been in the board room which usually means that the candidates aren’t adept at defending themselves, plus the fact that he was project manager of the whole sorry affair. When he walked in, you could see from his face that he expected to go – he knew he had messed up. However that wasn’t the way it went. When criticised over selecting the wheelchair, Simon countered that he thought that there would be housebound people watching who would be interested in the product. Whilst due to it’s high cost it wasn’t exactly an impulse buy, two people had bought. Sir Alan seemed to give Simon credit for this, but no credit at all to Naomi and Tre who had managed the sale. 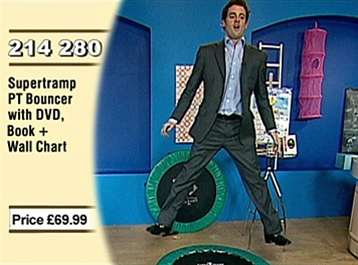 When it came to the fact that Simon had failed to sell any trampolines, or many of the decoupage pads it wasn’t down to Simon – Naomi and Tre were to blame there too for poor product choice. When it came down to the firing, Simon didn’t even figure, it was Tre for moaning too much, and Naomi for her poor product choice and unimpressive performance previously. Tre seemed to narrowly escape, resulting in Naomi getting the boot. I didn’t agree, neither did any of the panel, nor most of the audience on the Apprentice: You’re Fired – it was an amazing decision. I guess ultimately it comes down to the fact that by this point Sir Alan is very much picking based on the ultimate job he has for the winner, but still it was incredible that Simon survived.